The first 3D printed helmet! Do you remember the Kupol project? We already talked about this 3D printed helmet developed by Gabriel Boutin on our blog. We told you about the prototyping process of this great project using this 3D printing technology. Now, the Kickstarter campaign is launched and the 3D printed helmet is ready to be 3D printed for production. 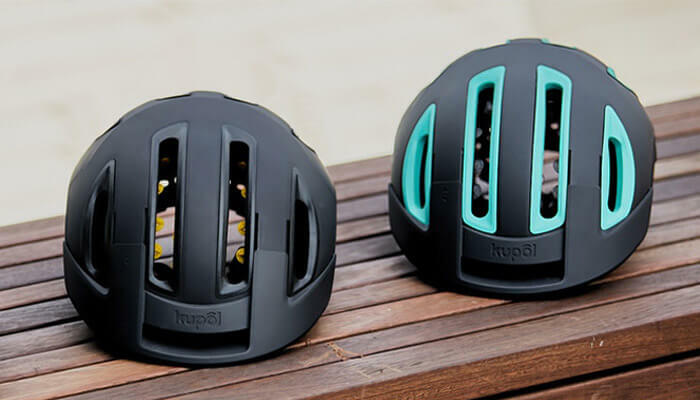 This helmet offers better fit and more security than a traditional cycling helmet. Discover all the information about this project, its safety system, and its production process. What is the Kupol project? 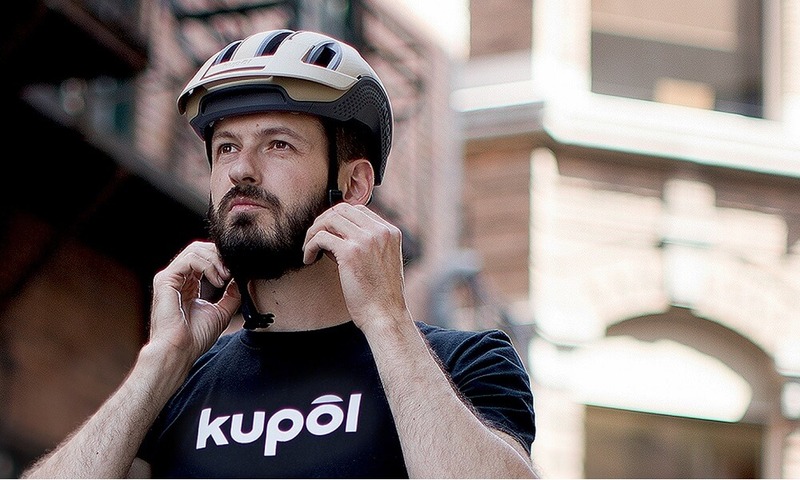 Kupol is an innovative company started in 2016 by Gabriel Boutin, a designer who has been working on helmets for 10 years before this project. Fascinated by the potential of additive manufacturing, Gabriel Boutin decided to use our online 3D printing service for his product development process. Additive manufacturing is actually the perfect method you will find in order to develop your products. Indeed, it is a time and money saving technique. Prototyping using the 3D printing technology is really convenient, you can easily make different iterations of your project only by modifying your model using 3D modeling software. How is this 3D printed helmet made? The helmet is made with a lightweight, flexible, breathable material. The whole structure is 3D printed using Sculpteo’s Multi Jet Fusion PA12. OKTOPUS™ pods are here to offer support and KINETIC BUMPERS™, to absorb impacts. Kupol actually developed a revolutionary safety system called the KOLLIDE SAFETY SYSTEM®. How does it work? This system is based on three soft, flexible and lightweight layers of material, with an opened structure creating a whole aeration network. This structure is then ensuring a breathable protection. The technology is called the KOLLIDE SAFETY SYSTEM® and it is based on three soft, flexible and lightweight layers of materials, with an opened structure creating a unique aeration network, and ensuring a breathable protection. Over 100 OKTOPUS® pods offer an ideal fit, and protect against quick rotational movements, replacing the traditional polystyrene. These individual cushions adapt their geometry for an enhanced comfort and eliminate any pressure points. 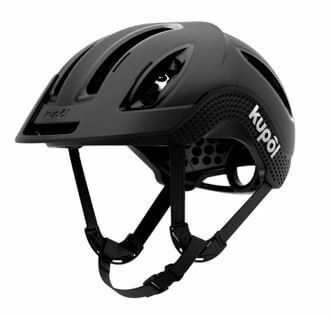 The Kupol cycling helmet totally renews the helmet design and structure by layering features to follow movements naturally. In case of impact, this helmet will absorb it. This 3D printed helmet ensures a comfortable fit and breathability. 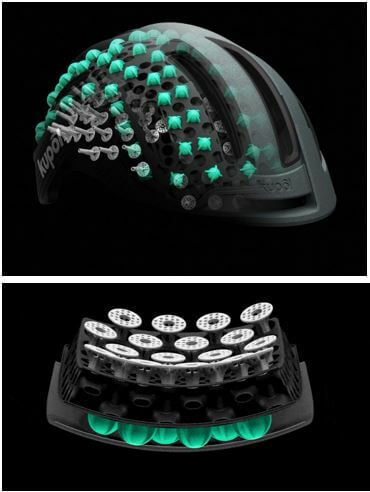 Safety, comfort, and aeration. Here is what this new 3D printed helmet is all about. You may know it, but one of the main advantages of additive manufacturing is customization. 3D printing is allowing to print low batches, which makes it possible for Kupol to produce his helmet in six different sizes. Customization is the key to comfortability. Versatility is also important in this project. The 3D printed helmet is versatile, as it can convert from an MTB type of helmet to an aerodynamic road helmet! The structure of the helmet has been 3D printed using our Multi Jet Fusion PA12 material, this material is perfect both for prototyping and production. The raw version of this material is actually the cheapest option we have on our online 3D printing service, which is perfect for any kind of prototyping process. Multi Jet Fusion PA12 is also great for production, as it has a really qualitative finish. It is also possible to add two finishes to your products 3D printed with this HP technology: the Color Touch finish or Color Resist finish. This project is the perfect example that you can use the 3D printing technology for both prototyping and production, in order to really the most of all the benefits of additive manufacturing. If you want to preorder a 3D printer helmet and support the Kupol project, check the Kickstarter page! Are you looking for a manufacturing process for your product development? You just have to upload your 3D files on our online 3D printing service.